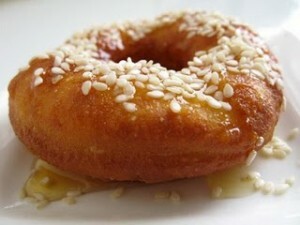 Delicious Homemade Doughnuts recipe by maham at DesiRecipes.com. Fried dough food that is a musthave with tea/coffee in the morning in most countries. Doughnuts are fun and easy to make. Follow these easy steps to make fresh homemade doughnuts. Mix refined flour, nutmeg , mace, salt , baking powder, sugar, egg and melted butter in a bowl. Knead flour mix into a dough by slowly adding milk into it. Sprinkle dough with a little flour and roll out into 1/4 inch thick rolls. Sprinkle sesame seeds on the rotis and press with rolling pins. Cut into doughnuts with a doughnut cutter. Heat oil in a wok and fry doughnuts until golden. Place delicious doughnuts onto paper towel and serve.